We’ve done diplodocine caudal vertebrae before but, what the hell, you can never have too many of them. Here’s the tail base of the Diplodocus mount (DMNH 1494) at the Denver Museum of Nature and Science. Note that the neural spines on the caudals are quite short and posteriorly inclined (this is also something we’ve covered before). But, whatever, it’s pretty isn’t it? Matt took the photo. 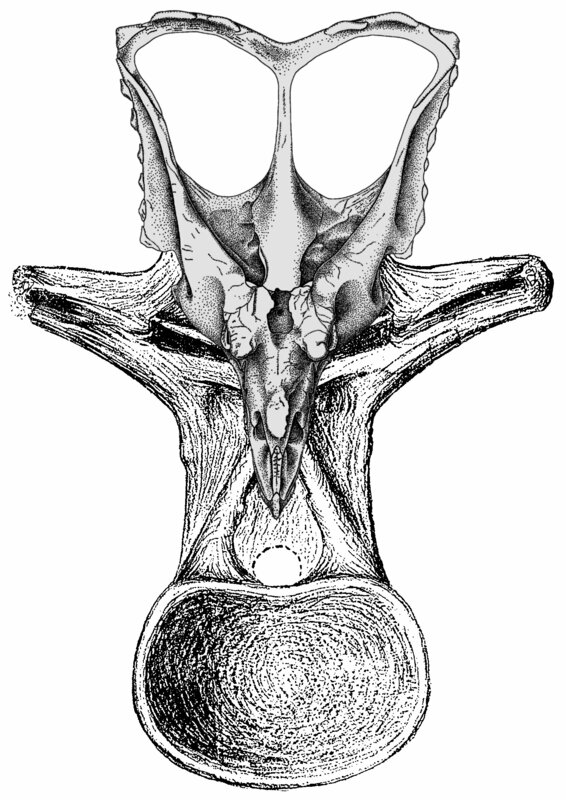 Internal structure of a cervical vertebra of Sauroposeidon, OMNH 53062. A, parts of two vertebrae from the middle of the neck. The field crew that dug up the bones cut though one of them to divide the specimen into manageable pieces. B, cross section of C6 at the level of the break, traced from a CT image and photographs of the broken end. The left side of the specimen was facing up in the field and the bone on that side is badly weathered. Over most of the broken surface the internal structure is covered by plaster or too damaged to trace, but it is cleanly exposed on the upper right side (outlined). C, the internal structure of that part of the vertebra, traced from a photograph. The arrows indicate the thickness of the bone at several points, as measured with a pair of digital calipers. The camellae are filled with sandstone. Image and caption recycled from fig. 14 here. Hat tip to Mike from Ottawa for the wonderful title. What Matt’s failed to mention is that this section of prezygapophyseal ramus is one of the elements for which he calculated the Air-Space Proportion (ASP) in his chapter in “The Sauropods”. As shown in his table 7.2, this calculation yielded 0.89. Just think about that for a moment. 89% of the bone was air. Yikes. It’s interesting that this was the only prezygpapophyseal ramus in the survey, and that it had a way higher value that any of the other elements considered, which topped out at 0.77, i.e., more than twice as much bone as this specimen. So maybe all prezyg rami are ridiculously pneumatic? So far (as far as I know) no-one’s measured the ASP of another ramus, so the answer remains, for now, ridiculously unknown to our planet. 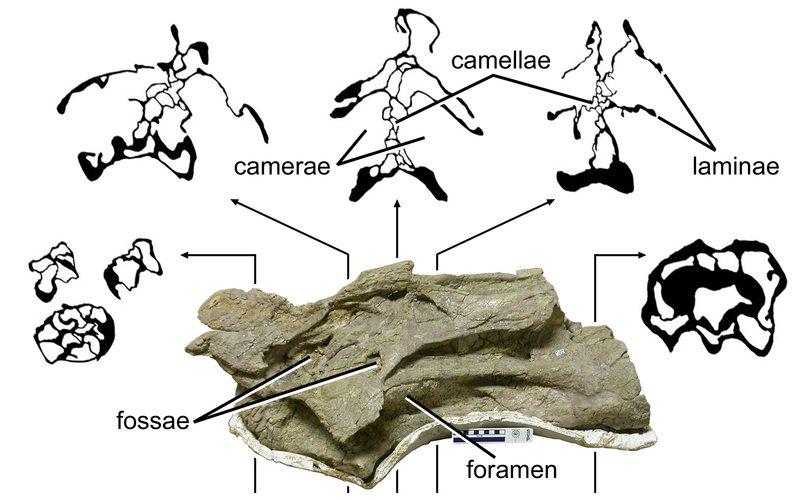 Basal sauropodomorph wizard Adam Yates has posted an entry on his blog showing more sauropod vertebrae/ceratopsian frill convergence, as follow-up to our own recent post. Too weird. I’m sure I need hardly point it out, but this neural spine has two badgering great holes in it! What the heck? This feature is seen on both sides of the vertebra, so it can’t be a simple pathology; yet it doesn’t occur in any of the other preserved dorsals (7-12) — nor, indeed, in any other sauropod vertebra known to me, camarasaur or otherwise. McIntosh et al. (1996:13) see this morphology in terms of “a slender, round rod extending down from the metapophyseal to articulate with the lamina arising from the epipophyseal” — in other words, that the lateral borders of the holes are novel additions to the bone, rather than the holes themselves being novel excavations in the bone — although as we’ve seen before, these things can be a bit six-of-one-and-half-a-dozen-of-the-other. They draw a parallel between this novel strut and the “diagonal ligament” described by Jensen (1988) in “Cathetosaurus” (= Camarasaurus) lewisi, but assert that the struts are bone, not tendon or ligament. I see this as convincing vindication for Mark Witton’s speculation on facultative carnivory in ceratopsids. Cope, Edward Drinker. 1878. On the saurians recently discovered in the Dakota Beds of Colorado. The American Naturalist 12 (2):71-85. Godfrey, Stephen J., and Robert Holmes. 1995. Cranial morphology and systematics of Chasmosaurus (Dinosauria: Ceratopsidae) from the Upper Cretaceous of Western Canada. 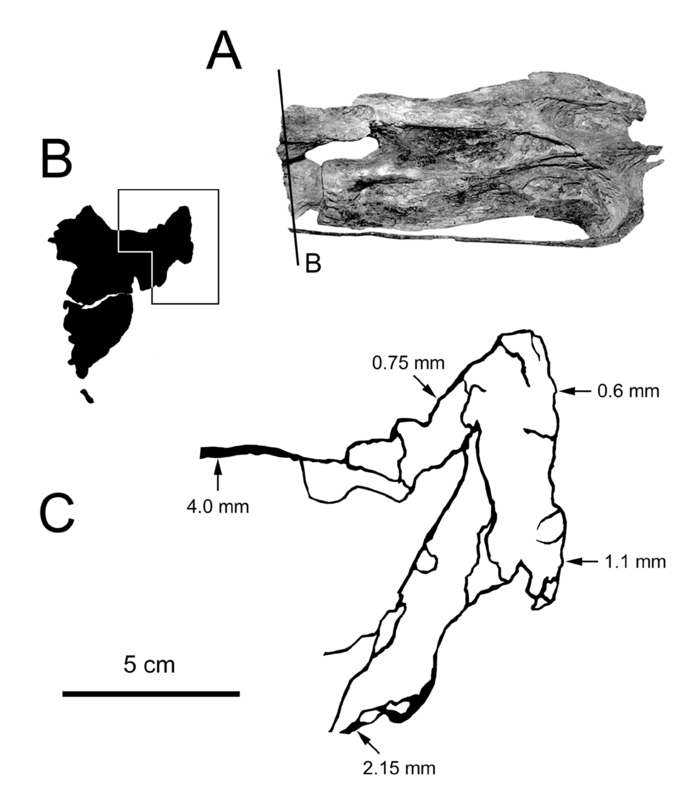 Journal of Vertebrate Paleontology 15 (4):726-742. McIntosh, John S., Clifford A. Miles, Karen C. Cloward and Jeffrie A. Parker. 1996. A new nearly complete skeleton of Camarasaurus. Bulletin of Gunma Museum of Natural History 1:1-87. It’s Ultrasaurus… I mean, um, Ultrasauros… err, Supersaurus! The remarkable object shown here (the one on the left) is a copy of the famous BYU 9044 bone. I know you’ve all heard the story a million times before: it’s the stuff of late-night parties, and fireside stories-from-grandpa, but it would be wrong not to recount it again. First described by Jensen (1985) as the holotype of the new brachiosaurid Ultrasaurus macintoshi (a name that was later changed to Ultrasauros macintoshi), it was much later shown – by Curtice et al. 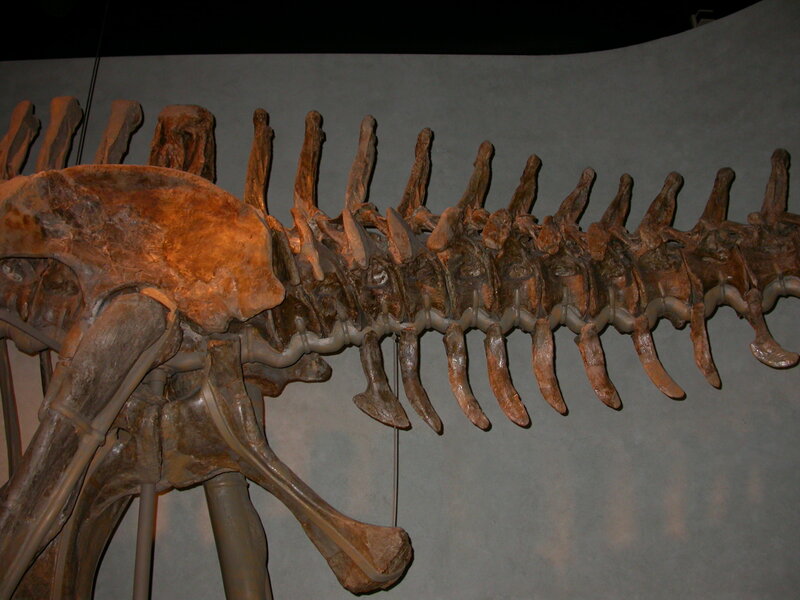 (1996) – to belong not to a brachiosaur, but to a diplodocid. Furthermore, because it was found literally among the bones of the holotype of the diplodocid Supersaurus vivianae, the most logical course of action was to, alas, sink Ultrasauros into Supersaurus… and hence Ultrasauros was no more. Jensen (1985) figured the vertebra in right lateral view, so the left-hand view you’re getting here is the sort of thing that has sauropod vertebra fans swooning and lying awake at night. There is, of course, a ton of neat anatomy to talk about here.. but I don’t have time to talk about it. You will no doubt have been impressed by the size: the scale is kindly provided by Sam Heads of Palaeoentemology and Insect Evolution. Curtice, B., Stadtman, K. L. & Curtice, L. J. 1996. A reassessment of Ultrasauros macintoshi (Jensen, 1985). In Morales, M. (ed) The Continental Jurassic. Museum of Northern Arizona Bulletin 60, 87-95. 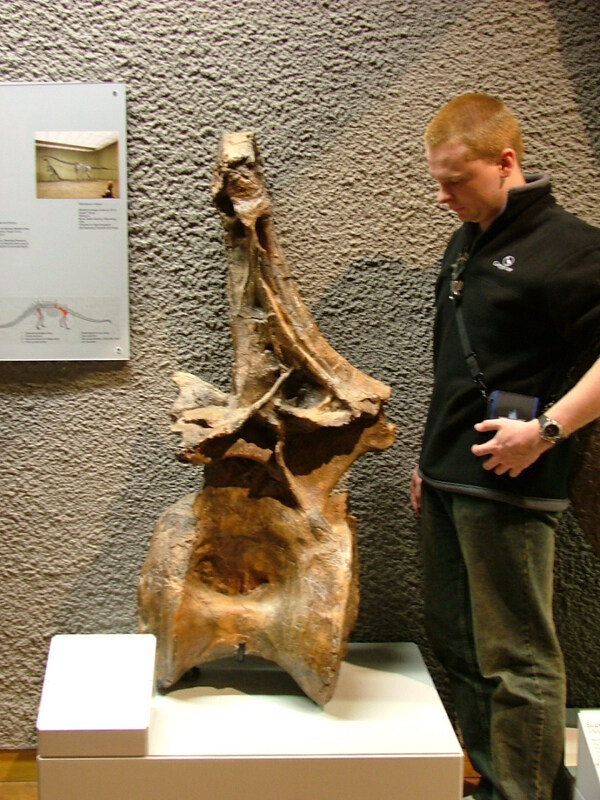 Special Bonus: Non-Sauropod Saurischian Vertebra Picture Of The Week! Hi, Mike here. It’s a bit rude to tag onto the end of Darren’s post, but I don’t want to make a brand new post and shove Ultrasaurus, er, Ultrasauros off the front-page. Anyway, I’ve made available my close-up photos of a turkey cervical. Click through the image for details. Enjoy! You know, we have not done what we intended with this blog. We intended to post pretty pictures of sauropod vertebrae, sketch a few lines of text a la our inspiration, and call it good. But not one of us is capable of shutting up–me least of all–so we sit down to write 6 lines and end up writing 60 or 600. Well, not this time. Here’s BYU 12866, probably a fifth cervical, almost certainly from Brachiosaurus, plus some CT cross-sections (the cross-sections have been straightened up a little to correct distortion in the specimen; see figure 12 here for the unexpurgated version). If they haven’t been defined before, camerae are big chambers and camellae are small chambers. Hat tip to Mike from Ottawa for the title.